Tomorrow night in Dublin 4, Ireland take to the field in a home competitive game for the first time since that night against Denmark 11 months ago. 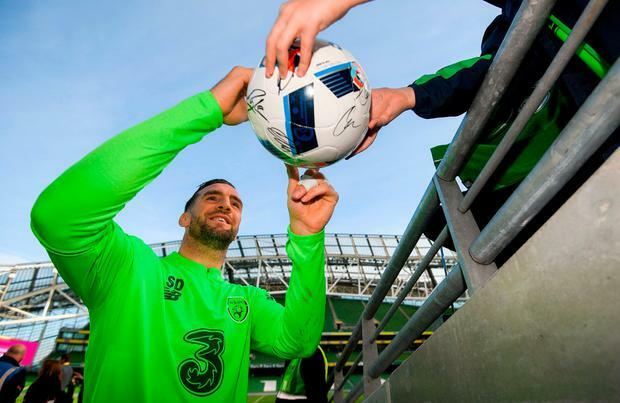 And Shane Duffy admits that the Republic's players have a point to prove if they are to win back the public's affection and admiration, the need to put right the wrongs of the disaster that was the World Cup play-off against the Danes. James McClean, a candidate to captain the side tomorrow, has claimed that the team have a point to prove to themselves and no one else, but Duffy knows the matter is bigger than some in-house stuff. "I think you play football for the fans. It's a huge part of the game," says Duffy. "But I think he (McClean) just means we have to prove we can play at this level first and prove to you (the media), the fans, that we can compete again and be a good team. "A couple of bad results doesn't make you a bad team and we've got good players here. Obviously we want to play for the fans but most importantly we've got to prove to ourselves that we're good enough to be here and play at this level. "You can't really dwell on it. For these games you can't really think it's a bit of a revenge game. It's not. "They got to the World Cup and we didn't and over the two legs they deserved it because they beat us. It's up to us now, we've got to play them tomorrow, I'm looking forward to getting the chance to play and hopefully put it right and don't leave here with the same feeling as last time," added Duffy, who admits that the loss to Denmark was a low point in his career. "I've had some bad ones but that would definitely be one of them, the worst, it was bad yeah." Duffy insists that Ireland's habit of pulling off big wins (Wales and Austria away) shows the side can do the job, but which Ireland will show up tomorrow: the team which lost so badly in Cardiff or the one which beat the Welsh in the same stadium last year? "We hope it's going to be the strong one, hard to beat and a good hard football team, a good team with good players who can turn up," he says. "Obviously we don't go out to play badly, Wales dominated us. It wasn't a nice night for us. It's up to us to make sure we're at it, playing our way and the way we've had success. That's down to us on the pitch." As he has played in the last two competitive games, Duffy has some clouds over his head in terms of the international scene, but at club level it's looking up for Duffy. The defender is on form at the opposite end of the pitch, as his two Premier League goals make him the leading Irish scorer in that division this season, while he also has security at club level, having only last week signed a new five-year deal with Brighton. "I'm delighted with it to be fair," he says of the contract. "It was obviously nice for the club to reward me sort of for how I've done over the last year or so. It's a place I'm happy at and feel it's getting the best out of me so it was a no-brainer." In terms of finding the net instead of stopping goals going into it, Duffy says he had set himself a target of scoring this season, having drawn a blank last term. "It was a massive disappointment last year that I didn't score a goal," he says. "I sort of aim for at least a few goals a season and I didn't score last year, which was disappointing for the number of attempts I had. "This year I got off to a nice start. I have two already, so I hope I can add a few more to that." Two goals in the green shirt make Duffy the third-highest scorer in the current squad, ahead of midfield men like Jeff Hendrick and David Meyler and he's keen to contribute there if he can: "I feel like I can score in every game, I feel like I'm a threat at set-pieces in the box".